I attended last week’s VMware Forum at Wembley, staffing the VMUG booth. As a leader of London VMUG, I was asked by Jean Williams from VMware if I could volunteer to staff the booth to promote our local VMUG and to recruit new members. Our chair, Alaric Davies, was also able to attend for the day, and it was great to see a contingent of our members stopping by and chatting to prospective members about the value of joining London VMUG, including Luke Munro, Ricky El-Qasem, Simon Eady and Simon Davies. 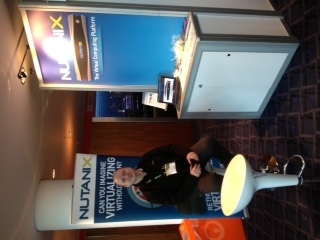 Although we only had a small booth, we were very busy during the breaks between the keynote and the break out sessions. I think we must’ve signed up over 50 new members, but the results of the scanning we did will be divulged later this week. Having attended last year, the layout was much more conducive in the Bobby Moore Suite to networking and chatting – previously it was crammed packed with lots of sponsors and bigger booths. This year VMware UK marketing had decided upon a tad fewer sponsors with smaller booths to allow for better movement around the hall. Joe Baguley – a tremendous supporter of all things VMUG, in particular our London meeting and our national UK user conference – stopped by to say “Hi” after his keynote and to confirm that the 21st November is already in his diary! I had the pleasure of sitting in on Joe’s keynote earlier in the day; as ever it was informative and entertaining with snails, kittens and chickens making their usual appearance 🙂 Other VMware VMUG supporters, such as our honorary committee member Martyn Storey, Mark Stockham, Matt Piercy and Brian Gammage were at the event and was great to catch up with them all, albeit briefly. 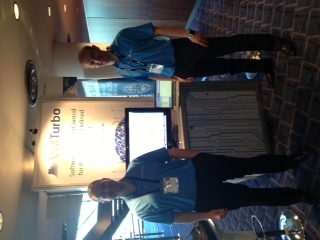 Two of the companies I work with, Nutanix and VMTurbo were both in attendance, with Nutanix basking in the glory of having just been announced as a Gartner Cool Vendor and VMTurbo’s newly hired VP Worldwide Sales, Chris Reisig, attending his first VMware Forum, in between conducting interviews for newly created sales positions in the UK. All in all, a busy, enjoyable day – great for networking and great for signing up new members. However, not too sure there was any real ‘meat’ for the attendees in the sessions, some of whom I spoke to said the same, good for networking but nothing really new. Don’t forget to mark your diaries for the next London VMUG, 4th July and for our UK User Conference 21st November, all details can be found at www.vmug.com ! As ever, we had a great meeting at the London Chamber of Commerce & Industry last Thursday, 25th April. In his usual endearing style our chair, Alaric Davies, kicked off proceedings and, as usual, asked for a show of hands for first timers. Interestingly as ever, about a fifth of the attendees were vNoobies. It’s encouraging to see many new faces, as well as our stalwart members. Kudos indeed to Greg and to London VMUG too! We were well represented by VMware as usual, with sessions on vCAC, Horizon, SDN and Robbie Jerrom presenting a Puppet Primer. Also a big thanks to our community presenters; Barry Coatsworth, Gregg Robertson & Darren Woollard, Lee Harris and our very own Stu Thompson. We had a couple of overseas guests too, demonstrating the draw that London VMUG has in the wider community; Shane Williford from Kansas City, Missouri and Javier Larrea from the Spanish VMUG it was great to host you in London. As always, many thanks to our sponsors – we can’t do these meetings without you! Mark your diary for our next meeting – July 4th, same time, same place 🙂 Don’t forget presos will be available on box.net/londonug. 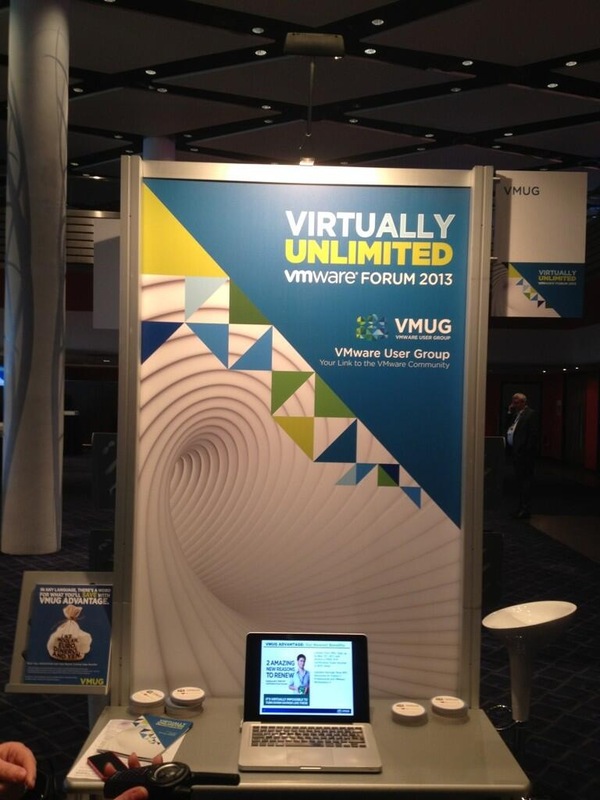 I’ll also be at the VMware Forum in Wembley this Thursday 2nd May, staffing the VMUG booth, stop by and say ‘Hi’. Can’t believe we’re already in April – the Easter break just flew by and now we’re gearing up for the Q2 London VMUG – busy, busy, busy! 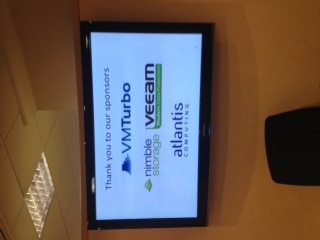 The agenda went live just before Easter, and we’ve got a great line up of speakers, both from VMware and the community, and from our sponsors; VMTurbo, Nimble Storage, Veeam and Atlantis, who is sponsoring our labs this time. Our day starts with registration and coffee from 8.30, with the first session starting at 10am sharp. We conclude, as usual, with vBeers at The Pavilion End. Apart from an awesome agenda, we will also have a special guest visiting us from ‘across the pond’, Mr Shane Williford aka @coolsport00 – welcome in advance Shane! We’re also excited to have Gregg Ferro aka @etherealmind speak, since my involvement with the London VMUG I’ve not had the pleasure of meeting Gregg, so looking forward to that! Remember to register here and if you can’t make this one, our next meeting is planned for July 4th, so put that in your diary now! I’m not going to be a ‘follower’ and write up my 2013 predictions, rather I want to share with you my overview of this past year. This post will end, though, with some random insights into 2013 from my point of view. I also started writing this before 21/12/12, when of course the world will end, according to the Mayan calendar, or certain peeps’ interpretation. So I hope I’m not wasting my time, but I really don’t believe in this rubbish, but it’s fun reading some of the tweets on it, particularly this one that lots of tweeps tweeted. So, back to 2012 – January was a busy month in terms of events; I attended my first Cloud Expo Europe and Cloud Camp London, followed by our London VMUG meeting on January 26th (interestingly enough my January 2013 looks exactly the same thus far!) I also started working with a new cloud service provider, Calligo, who launched their service on VMware and have a unique offshore value prop. February also held a first for me, being on a Chinwag with Mike Laverick, despite my dodgy satellite broadband connection, we had a great chinwag over Skype. Mike is always so easy to talk to and asks some great questions and has a point of view and knowledge of so many things IT related. February was also the VMware Partner Exchange, PEX, in Las Vegas and although I didn’t attend, I was responsible for one of my client’s, Centrix Software, attendance. Having recently opened their US office, PEX was a great venue to attend and they signed up Presidio by being there. On a personal note, March saw me completing a ‘bucket list’ item, seeing the Aurora Borealis (Northern Lights) in Iceland – totally amazing and I can thoroughly recommend anyone to see them! 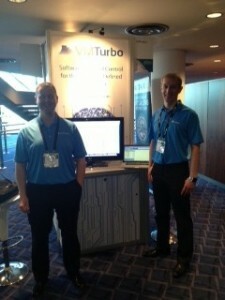 April saw me starting consulting with VMTurbo here in EMEA. The unique workload algorithm of their technology is very exciting and they’ve secured some big customer wins in 2012 this side of the pond. May bought forth another new and exciting client, Nutanix. I was part of the team for their launch held at BriForum London – the launch party was opened by none other than Brian Madden and was attended by many customers, partners and industry folk, including some fellow bloggers. VMware Forum was also held in London and this event saw me donning my VMUG hat and manning the booth to recruit new members. My fellow London VMUG committee member, Simon Gallagher and I signed up nearly 50 new members in a day, some of whom we’ve since seen at London meetings. May also saw me arrange two of the very last vendorwags posted on RTFM-ed prior to Mike moving over to VMware with both VMTurbo and Nutanix being highlighted. 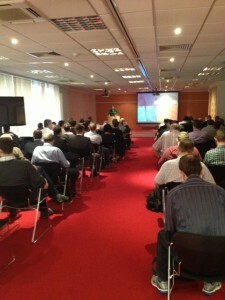 And of course, we held our Q2 London VMUG meeting May 17th. June was a celebratory month of our lovely Queen’s diamond Jubilee. With this and the opening of the Olympics the following month, Britain truly was Great again! July saw the launch of the new industry awards from Tech Trailblazers, encouraged all my clients to submit and December saw Nutanix as a runner-up in the virtualization category. 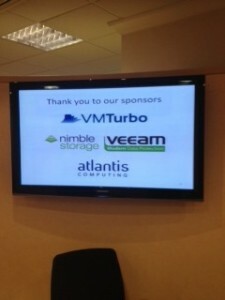 We also held our last London VMUG of the year July 19th. We’ve always held 4 meetings a year, up until last year, when we organized the first User Conference in November, which we again organized this year, hence only 3 LonVMUG meetings. August was VMworld month! 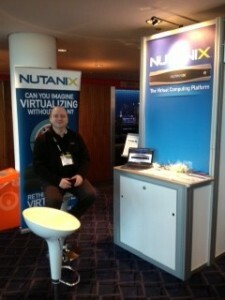 I was delighted to attend with Nutanix who sponsored my trip in return for booth duty. This enabled me to attend many sessions and to also attend VMUG leader activities, as well as vExpert activities. I also was lucky enough to get Olympic tickets for equestrian at Greenwich. It was an amazing opportunity and am so pleased I was able to ‘be there’. One week after my return from San Francisco, I was on my way back to Boston in September. This was a bittersweet trip for me as it was to attend a memorial for my dear friend and mentor, José Carrerio. José had passed away unexpectedly in Costa Rica in April and this was a celebration of his life. Past Citrix friends and colleagues were in attendance, including Ed Iacobucci, the founder of Citrix. 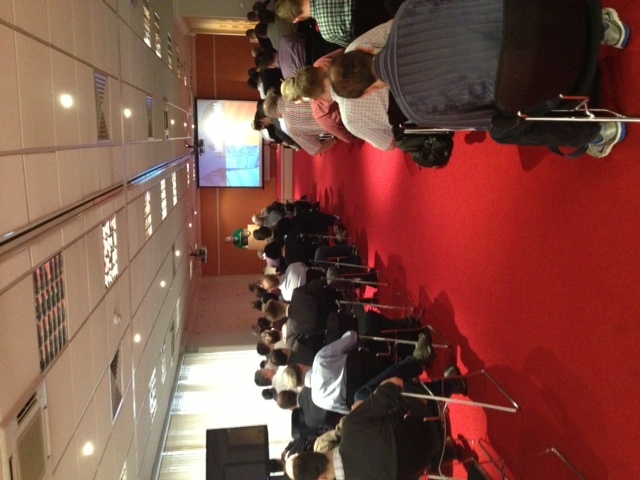 September also saw the planning start to ramp up for the forthcoming VMware User Group Conference in November…. I was back at VMworld Barcelona in October with Nutanix, again allowing me to undertake VMUG and vExpert activities when not staffing their booth. It was an awesome show, apart from the schlep between the Solutions Exchange/Lab area and the main sessions area. I arranged the first NDA blogger session, prior to Tech Field Day 2, for Nutanix and it was well attended by bloggers from across EMEA. November saw another successful VMUG User Conference up at the National Motor Cycle Museum. 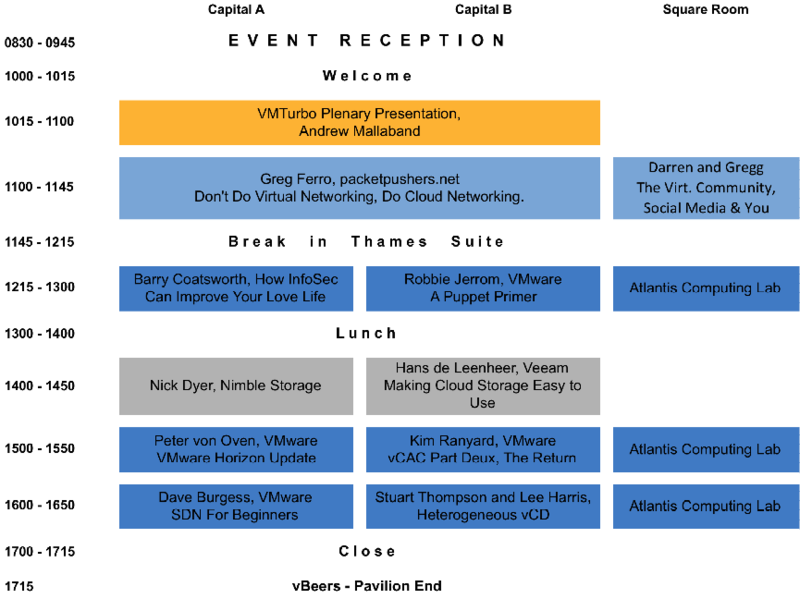 I’m sometimes asked (and think myself) why do we, the London VMUG Steering Committee, do what we do – we are ‘volunteers’ as our badges highlighted at the event! Well, for me, the answer is simple – post-event the tweets from our members are what make it all worthwhile. Tweeps having a great, informative day, free of charge (thanks to our awesome sponsors) and meeting some of their heroes is all the thanks we need to keep on doing it, unpaid and voluntarily! We held our VMUG wrap up call in December, where we held a ‘post-mortem’ on the event. Only a few minor niggles where highlighted for improvement, but overall another successful event – here’s to 2013!! I predict a great new podcast, created for the sole purpose of demonstrating how women are part of ‘AdaptingIT’ – this podcast was announced on John Troyer’s VMTN the other week, but I encourage you to listen, the inaugural discussion is with VCP #1, Susan Gudenkauf. Lauren Malhoit is the genius behind this, but both Mike Laverick and I have been involved in helping Lauren set this up, and am privileged to have had a helping hand. Thirdly, will 2013 be the year of “federated cloud” and will VDI actually take-off? I predict the term VDI will die and be replaced with a generic EUC or desktop virtualization label and I do see technology coming to the fore to accelerate federated clouds. But will 2013 be the “year of” both federated cloud and desktop virtualization? I believe it will be the same as any technology, it will gradually grow and accelerate and go from being emerging to incumbent. 2013 will be a ‘passing through’ year for both on their journey to incumbency. So, in signing off for 2012, I send best wishes to you all for the festive season and a happy and prosperous New Year!